Train ride from Asakusa to Tokyo Disneyland was a bit tricky as you need to traverse three (3) train lines (with 3 trolley bags and 2 backpacks). We thought of hiring a taxi, but was a bit turned off with the unjust fare of Y8400 (about P3700) for a taxi ride. So we braved the dependable and cheap train ride, which only cost about Y1900 (about P840). TIP: Study Japan's train system well. Plan your train rides/transfers. You can use google map for this. Other android applications which proved useful during our train planning were: Tokyo Rail Map Lite and Tokyo Subway Navigation. The sign that told us we were still on the right track. We arrived at the Maihama Station after 45mins. The travel went well, despite a little mishap. 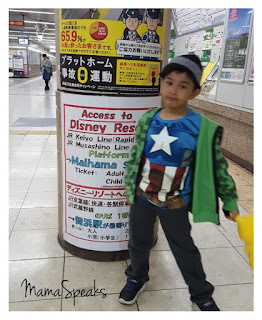 We took the stairs, unknowing that there was an elevator while transferring to Hibiya to Keiyo line (Oh, my poor husband who had to carry most of our luggage). We arrived at Tokyo Disneyland Resort (TDR) at 9am and headed to the Tokyo Disney Resort Welcome Center. The TDR center is located left of Maihama Station. TDR Hotel guests may leave their luggage here (if arriving earlier than the hotel check-in time) and buy themepark tickets. We pre-booked a room at the Tokyo Disneyland Hotel for two (2) nights. It was quite expensive than settling for a hotel outside the TDR complex, but it was very convenient. And hey, we will be sleeping right next to Mickey Mouse. We got a 3 days Magic Passport which allowed us one day each at Tokyo Disney Sea (TDS) and Tokyo Disney Land (TDL) and a free day at either TDS or TDL. At the back is our hotel for 3 days and 2 nights ~ Tokyo Disneyland Hotel. After depositing our bags at the TDR Welcome Center, we proceeded to Tokyo Disney Land. Check out Day 5 of our Tokyo Japan adventure.